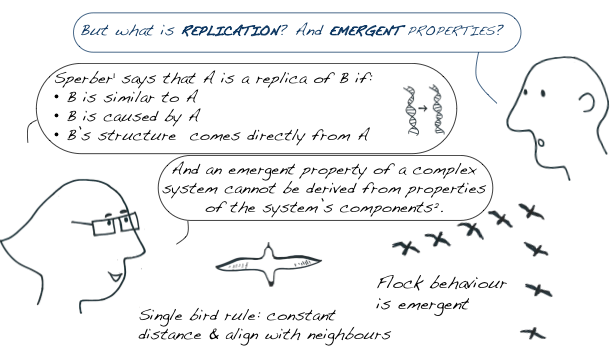 Monica Tamariz presented a poster at Evolang (runner up for the best poster award) about linguistic replicators. This is an alternative view to Andrew Smith’s talk and Bill Benzon’s post on the same subject. EDIT: However, where does she locate the interactor, the entity on which selection operates? And what’s the agent doing the selection? 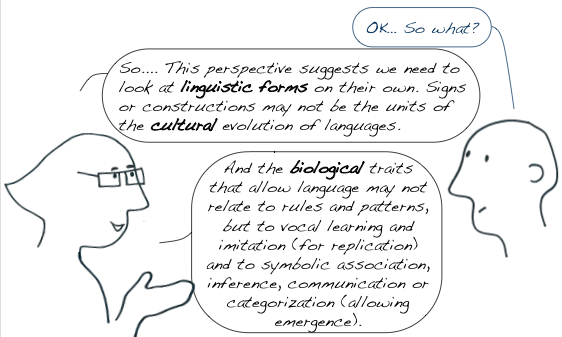 BBenzon, I do agree with most of what you say in your post… If I had to posit an interactor, it would be the mental form-meaning mappings that *emerge* form the interaction between public form replicators and the communicative environment. 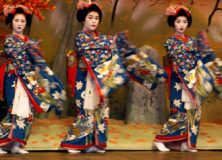 Selection agents are mental entities — the concepts or meanings, as well as other form-meaning mappings. 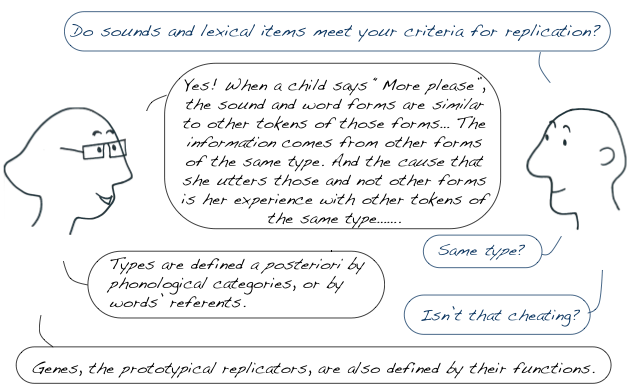 There is competition between replicators (lexical item-forms) for meanings. One FM mapping’s fitness depends on how well it captures a meaning (in other words, how good it is at eliciting the meaning e.g. through iconicity, high frequency etc). Its fitness is therefore also a function of how well it fits in with the rest of FM mappings (systematicity, compositionality, ?phonology?). That’s a damn convincing rationale, actually. 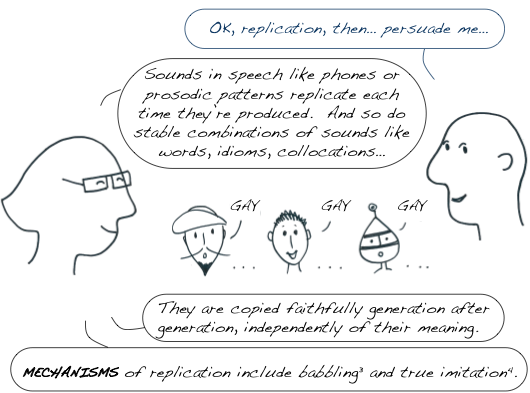 At first I was like “yeah this might be a correct conception of replicators, but isn’t it missing out on the most interesting aspect of cultural conventions by leaving out their function?” But if you think about the genetic parallel then it’s obvious that the function, however meaningful and important it is to us, is only secondary. 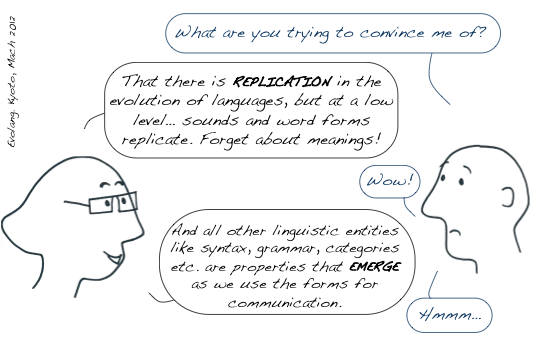 Still, it just moves the burden from the replicator to the replication process, and the emergent communicative function is after all what most linguists are primarily interested in. Which shows up how complicated linguistics really is: it’s like genetics, where they’re trying to figure out how the replicated ‘message’ is translated into something purposeful and functional in a highly complex and interactive fashion, with the added difficulty that the code in which the message is written is under constant negotiation and its functional interpretation is at the hands of different humans’ conceptual systems. Oh joy. On second thought I’m again doubting the usefulness of this conception, since what we wanted was actually a selectional theory of culturally learned behaviour (be it acting on others by uttering a certain sound stream), right? But due to the arbitrariness of symbolic form this theory can’t give us any insight into that if we completely leave the contexts in which the utterances are produced out of the equation? OK, Monica (if I may), it seems that we’re more or less in general agreement. The interactor is in that “emergent” stuff. 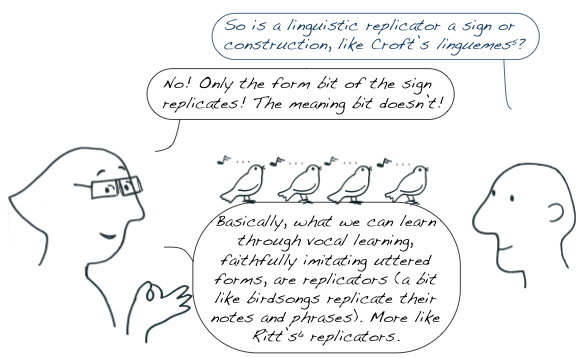 As far as I can tell, Croft argues that the speaking individual is the interactor, and David Hull, I believe, makes much the same choice in the case of scientific ideation. That’s a very different conception and, I believe, wrong. 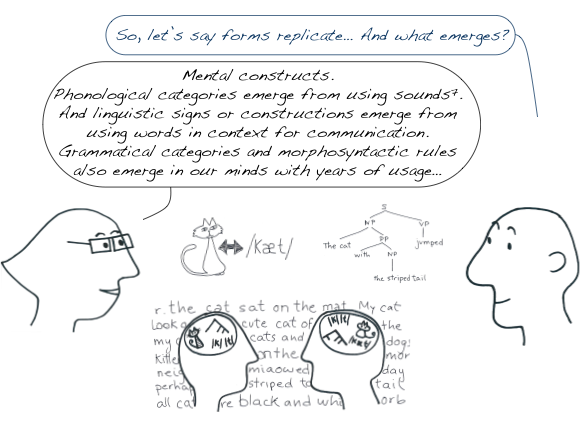 Considered physically that “emergent stuff” is neural activity in the brain of a speaker. The environment in which these interactors, these cultural phenotypes if you will, must survive, is, in effect, the collective nervous system of the group. Just how one conceptualizes that, that’s a tough one, though I took preliminary steps in my book on music (Beethoven’s Anvil).